So, you’ll notice that I didn’t mention the food. That’s because it was really the only con. Which is why, even though I liked the place and had a pretty fun time, I wouldn’t go back. Let’s discuss. The cuisine at Hawker Fare is “Thai street food.” I have no idea how authentic it is since I didn’t eat any street food when I was in Thailand. However, as a normal urban American, this is not like other Thai food I have tasted in other restaurants. We ordered a number of things, some of which were good, others of which were not as good, and one of which was completely inedible. 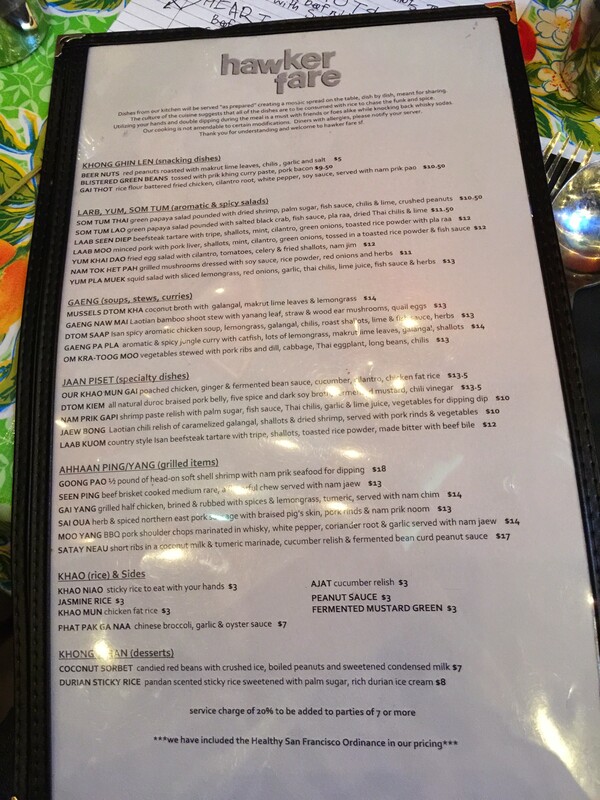 First, here’s a look at the menu since it’s nowhere to be found online. I believe you can click to enlarge to actually read it if you’re so inclined. 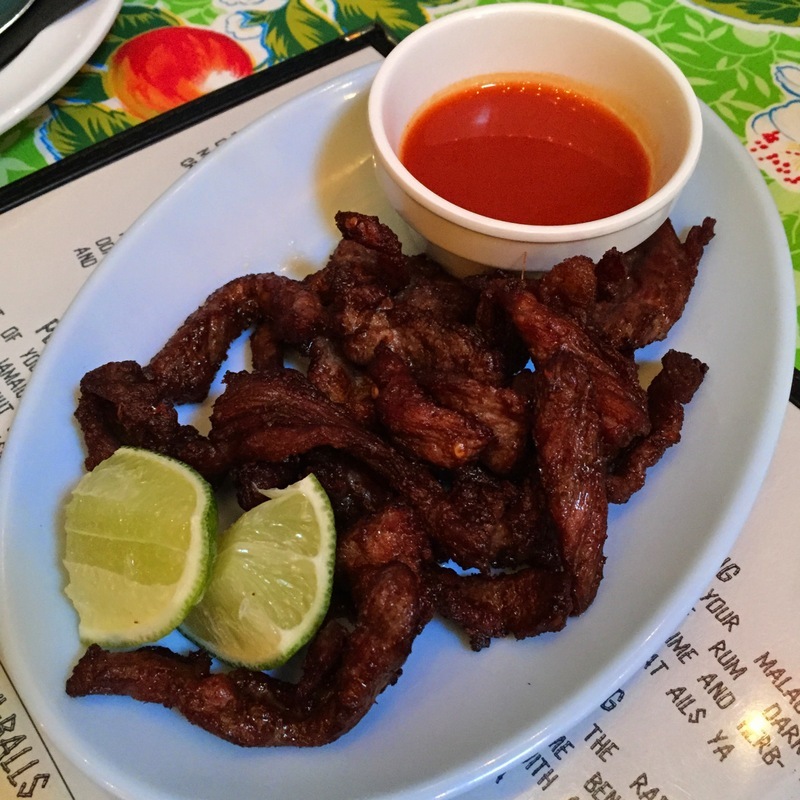 The boys started with some Neur Thot off the specials list, which is fried sliced beef rubbed in garlic and Thai chilis, and served with Sriracha ($9). I was told this was good, and it looked pretty good. Som Tun Lao: green papaya salad pounded with salted black crab, fish sauce, pla raa (your guess is as good as mine), dried Thai chilis, and lime ($11.50). This dish was spicy but pretty tasty. The soft shell crab was the hardest “soft” shell I’ve ever had, and was not a good addition. 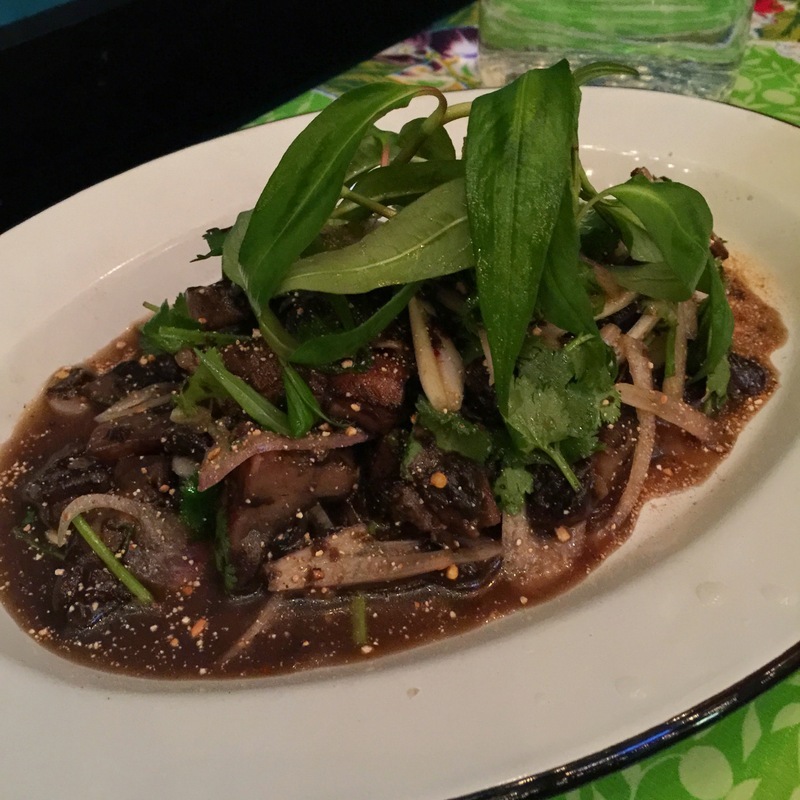 Nom Tok Het Pah: grilled mushrooms dressed with soy sauce, rice powder, red onions, and herbs ($11). This dish was decent, although I didn’t love it like I thought I might, considering my love of mushrooms. Others in my group liked this dish. 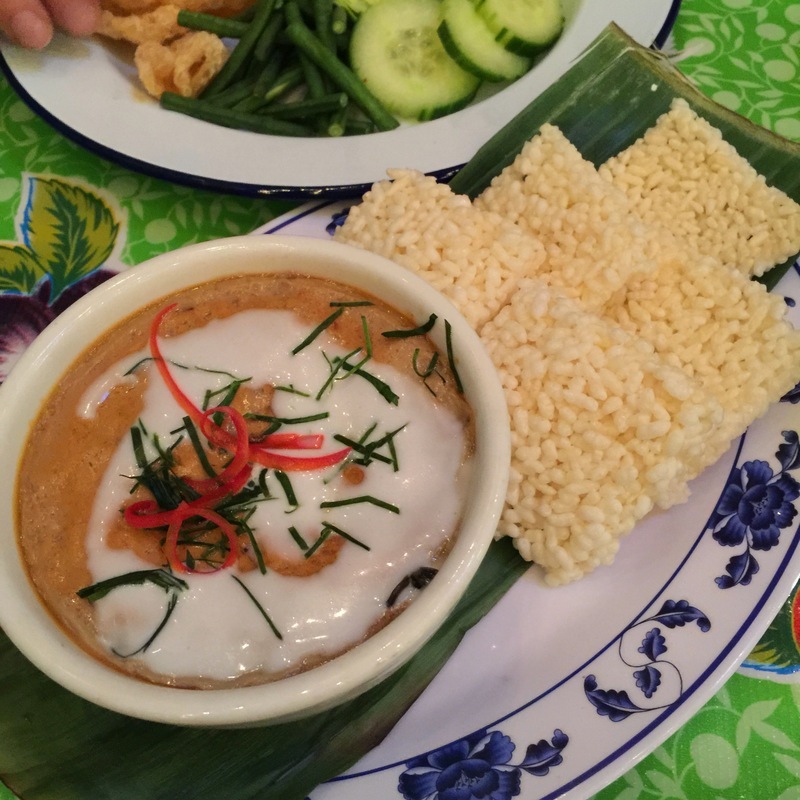 Hor Mok (off the specials list): steamed red curry, shrimp, fish, coconut milk, basil, and rice crackers ($14). This dish wasn’t a typical curry — the fish and shrimp were pulverized and the whole thing had the consistency of a runny quiche. It was delicious and I could have eaten it indefinitely, especially on the little rice crackers that came with it. 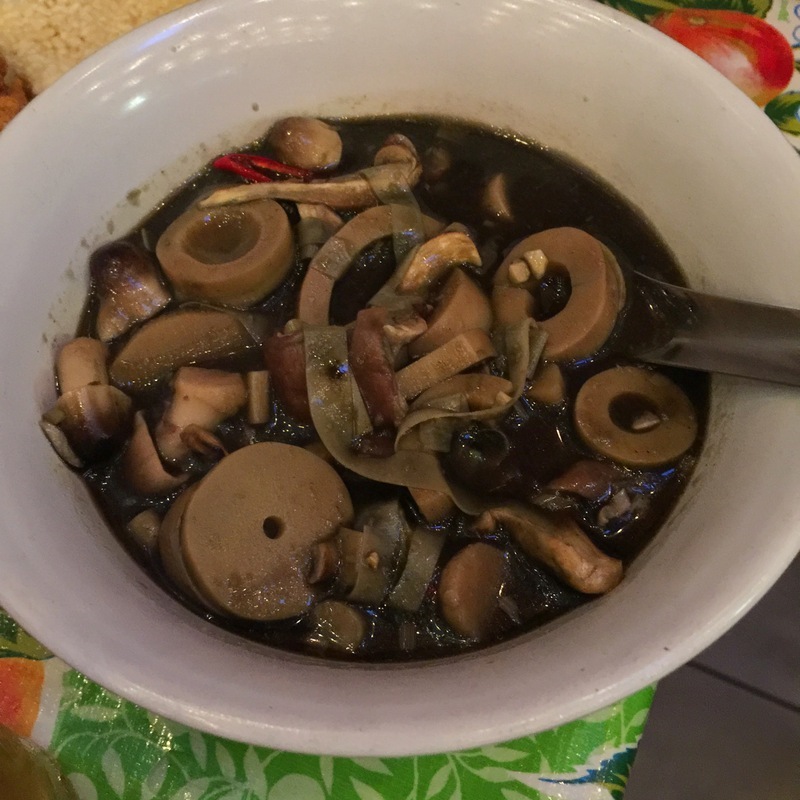 Gaeng Naw Mai: Laotian bamboo shoot stew with yanang leaf, straw, wood ear mushrooms, and quail eggs ($13). This dish tasted like a wet dog smells. It was gross. Not inedible, but still gross. I’m not even sure what it was in the mixture, but the liquid was super strong tasting (and smelling) with doggy-ness, and we never even saw a quail egg. 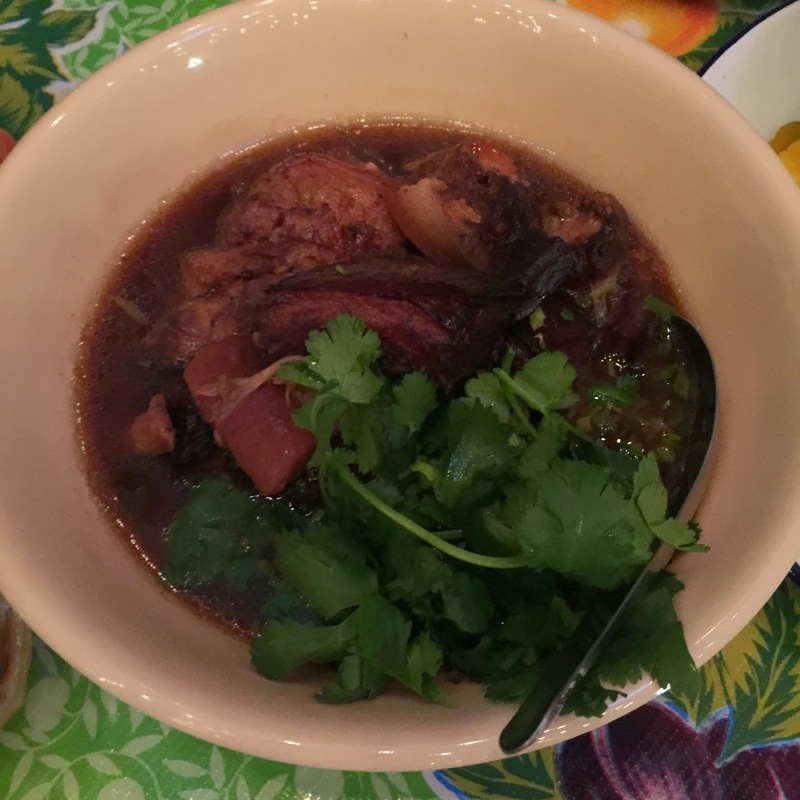 Dtom Kiem: all natural duroc braised pork belly, five spice and dark soy broth, fermented mustard, and chili vinegar ($13.50). I did not eat the pork belly, but was told that it was very good. 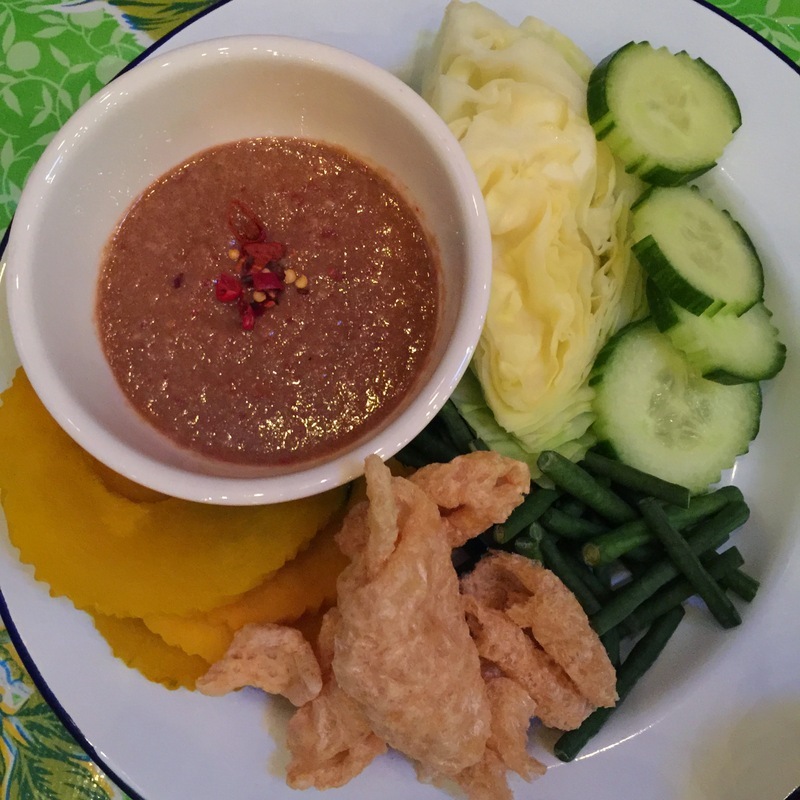 Nam Prik Gapi: shrimp paste relish with palm sugar, fish sauce, Thai chilis, garlic, lime juice, and vegetables for dipping ($10). Ah, the shrimp paste. I thought it sounded good from the description. Unique. Fun. In actuality, it was inedible. It took me a couple bites to realize it, but it was. It tasted so, SO fishy that it was completely overwhelming and, dare I say, disgusting. To be fair, the waiter had warned us about it, suggesting instead that we try the other Laotian relish that was served in a similar fashion. But I wanted to try the shrimp paste, so shrimp paste we tried. And we will not try it again. Khao Niao: sticky rice ($3). Comes served inside a plastic bag in a little bamboo cylinder and is very yummy. So, that was that. It was actually pretty fun trying something a bit outside the box for a change. The place appears to still be popular; apparently others are more adventurous than I. 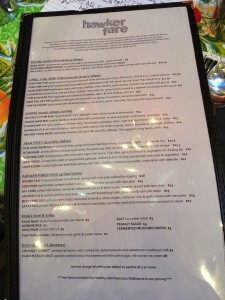 Also, it’s worth mentioning that the menu is mainly meat options with only a few seafood dishes and pretty much nothing vegetarian. So you might do better here if you’re a full meat eater. If you’ve been here and had a different experience, tell me about it in the comments below! Wow! I’ve never heard a negative review from you! I think you have pretty broad tastes. I suspect this is a place to go with a group for drinks after work and share a few things that are less than disgusting. 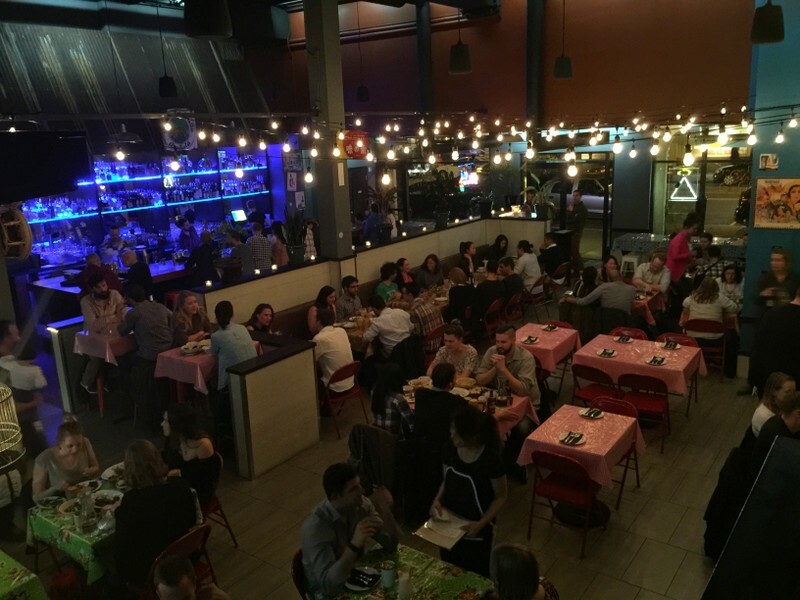 Sounds like it is generally fun, but not the place to go for a good meal. So many other places to enjoy in the City!